Present: Sri. 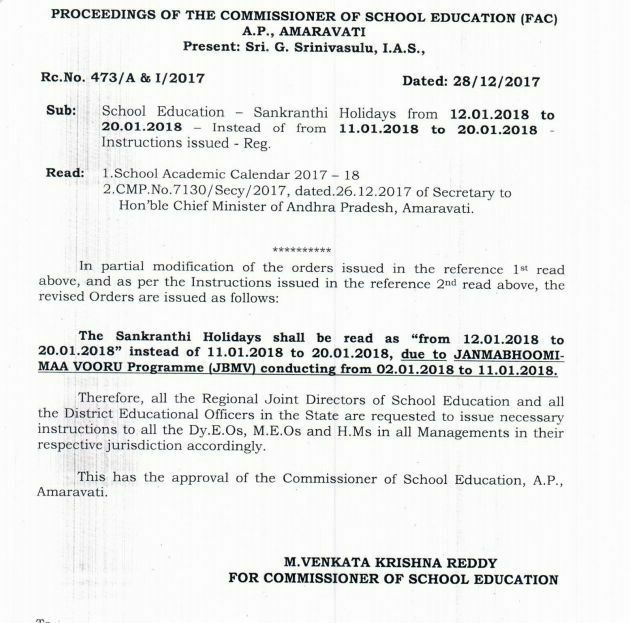 G. Srinlvasulu, I.A.S..
Sub: School Education - Sankranthi Holidays from 12.01.2018 to 20.01.2018 - lnstead of from 11.01.2018 to 20.01.2018 Instructions issued - Reg. 2.CMP.No.7130/Secy/2017. dated.26.12.2017 of Secretary to Hon'ble Chief Minister of Andhra Pradesh, Amaravati. The Sankranthi Holidays shall be read as "from 12.01.2018 to 20.01.2018” instead of 11.01.2018 to 20.01.2018, due to JANMABHOOMI MAA VOORU Programme (JBMV) conducting from 02.01.2018 to 11.01.2018. Therefore, all the Regional Joint Directors of School Education and all the District Educational Officers in the State are requested to issue necessary instructions to all the DyE.Os, M.E.Os and H.Ms in all Managements in their respective jurisdiction accordingly.